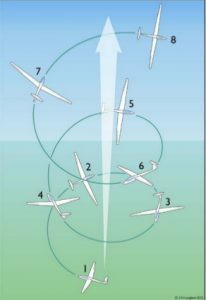 Gliders are aircraft without engines, also known as sailplanes. Most are single-seaters but two-seaters are also used for fun flying with friends and obviously for training. While you are learning to glide you will fly in two-seaters until you are competent enough to fly solo (on your own without a gliding instructor). Two-seat gliders have the same controls and instruments in both front and back seats, to allow the instructor to demonstrate or take control when required. 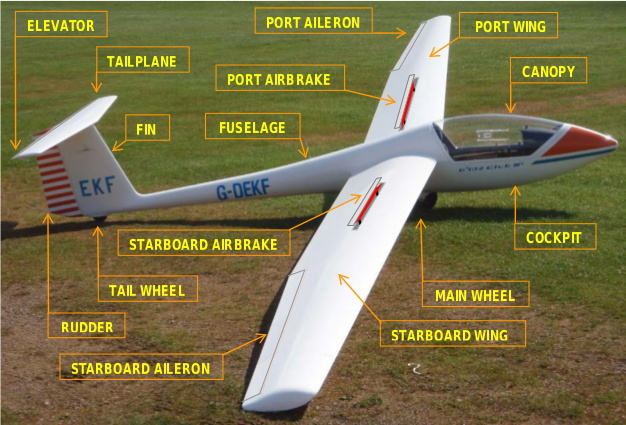 Gliders are built to international standards and are generally stronger than similar sized powered aircraft. In the early days they were usually built from wood, some from metal, but for the past 40 years virtually all of them have been made from glass fibre composites and many now use carbon fibre composites. They are subject to inspection every day they fly and are taken off-line every year for maintenance and inspection. As a result they last for many years, with a few older than 75 years still flying. Most gliders are designed to be good cross-country aircraft, but some, particularly two seaters, are designed for specific purposes, such as basic training or aerobatics. Most gliders can do a little of everything. Occasionally, gliders do have engines (although purists argue they are no longer gliders!). These come in two varieties; self-launching or self-sustaining. Self-launchers can launch themselves without any other assistance. Self-sustainers, commonly known as ‘Turbos’, however, are used only to stay airborne if for example if you can't get home on a long cross-country flight. Staying Up: How does a g lider stay airborne? It is always descending through the air it is flying through, in the same way, if it is to keep moving, that a toboggan moves downhill. 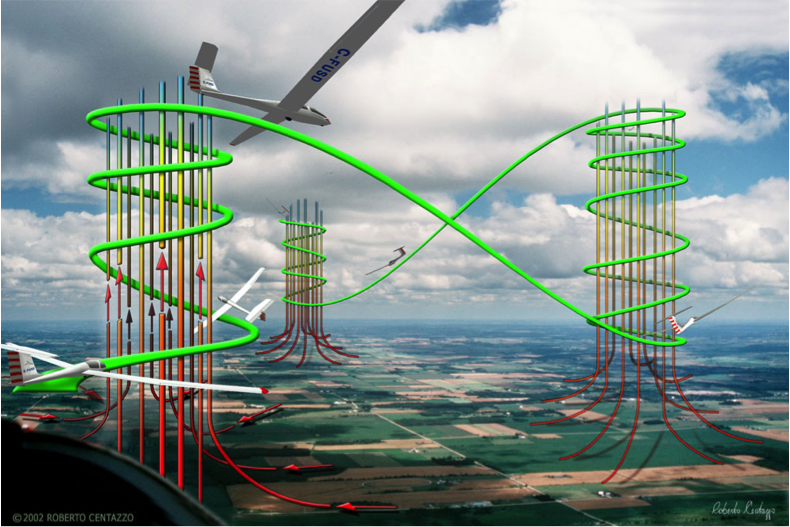 So to stay aloft, gliders must find air that is rising at least as fast as the glider is descending. There are three main ways in which this can be achieved. Thermals: You may have seen birds circling upwards without flapping. They are "thermalling". 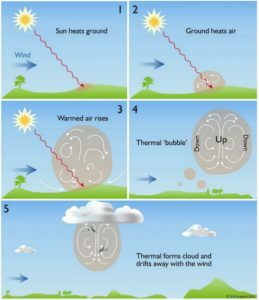 A thermal is a volume of air that has been heated by the sun more than the surrounding air, perhaps because the ground under it was drier or darker than that surrounding. As this hot air rises it forms a thermal and by circling within this air, birds or gliders can gain height. Having gained height this can then be used to fly off and hence travel across country. 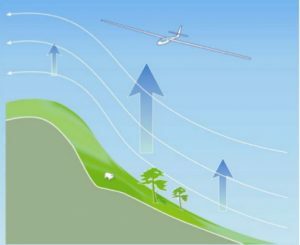 Glider pilots find more thermals to travel great distances by either educated guesswork, based on ground features, or more often by flying to cumulus clouds that form at the top of the thermal. Flights of over 300 km are routinely made throughout the summer from this airfield and a few flights of over 750 km have been made using thermals. Ridge lift: The BGGC mo ved here in 1956 and acquired another way of staying aloft. The Cotswold Edge which forms the north-facing hill immediately adjacent to our airfield and the west-facing ridge about a mile to the west. 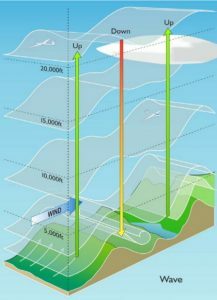 When the wind blows towards those ridges it is forced up and the air ahead of and above the hill provides the rising air required to support gliders. In the early days only the local ridges were used, but as glider performance has improved, given the right wind conditions, we can now soar the ridges south to Bath Racecourse and north to within a few miles of Stratford upon Avon. Even if conditions aren’t right for such long flights, soaring the local ridges is still fun and particularly helpful for pilot training. Wave lift: H arder to explain or imagine than thermal or ridge lift, the phenomenon known in gliding circles simply as "wave", more accurately known as “Orographic Lee Wave”, arises when wind blowing over hills rebounds in the lee of the hills and goes back up again, creating a smooth upward flow of air. This lift is sometimes capped by a cigar-shaped "lenticular" cloud that does not drift with the wind. This wave or oscillation often continues for several cycles downwind, sometimes many cycles downwind, meaning that you don’t necessarily have to be close to hills to use it. The chief attraction of wave lift for glider pilots is the opportunity to go very high – over 20,000ft has been achieved flying from the airfield here at Nympsfield, well above the level where oxygen supply for the pilot is essential.